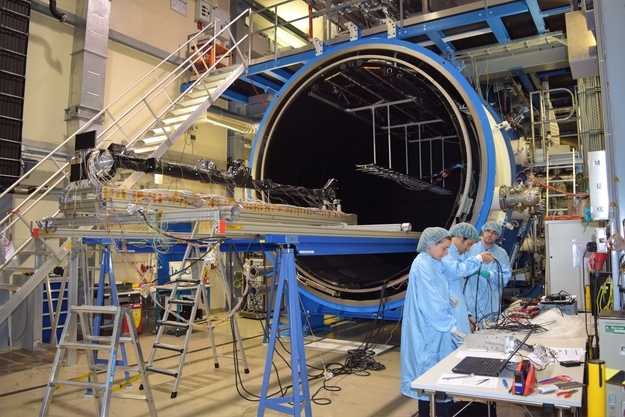 Engineers working on the MAG boom of ESA's JUICE mission, which will investigate the Jupiter system, during tests in the thermal vacuum test facility 3m – TVA at the IABG test centre in Ottobrunn, Germany. The 10.6-m long boom, provided by SENER, carries sensors for the J-MAG magnetometer and for the Radio and Plasma Wave Instrument (RPWI), which will provide data on Jupiter's magnetosphere, plasma and the fields surrounding its giant moons. The tests were run as part of the MAG boom development programme in order to validate current engineering assumptions and guarantee the overall thermal performance of the boom and of the sensors attached to it. The data from more than 100 temperature measurements have now been analysed and used to update and validate the thermal mathematical model, a key step to ensure that the MAG boom and its five scientific sensors will survive the thermal extremes of both the spacecraft's long cruise to Jupiter and of the giant planet's environment.